Finding a stranded baby chipmunk can pull at your heart strings and make you feel sorry for the little critter. It's important to remember, however, that they're not domesticated animals and don't handle captivity well. If you find a stranded baby chipmunk, a few quick decisions need to be made on whether or not he really needs rescued. Chipmunks are small ground squirrels often characterized by reddish fur and black stripes or markings. The eastern chipmunk weighs 2 to 4 ounces at maturity; their young are much smaller. 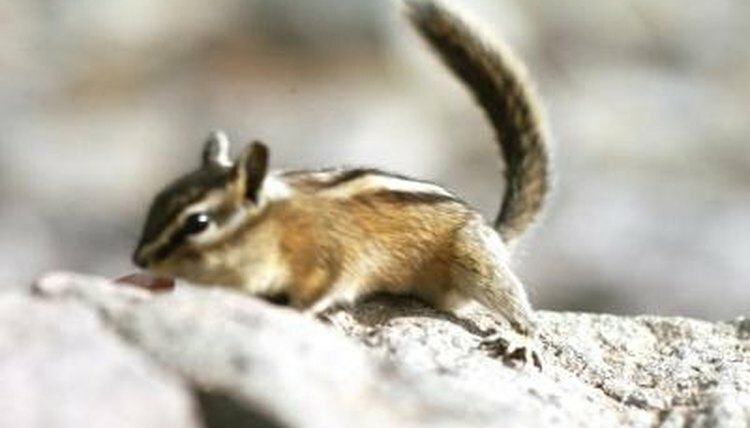 Throughout most of its range, the eastern chipmunk has two litters of offspring a year; mating seasons are in late summer and early spring. While they most often inhabit in woodlands and on the edge of forests, they also enjoy inhabiting suburban areas where they feast on bulbs and other parts of ornamental plants. Babies normally leave the nest when they're about two-thirds their mature size; occasionally, however, they may find themselves outside of their protected burrow or even orphaned. Look at the baby chipmunk without touching it to see if it has any obvious or broken bones, is bleeding or shivering. Any one of these symptoms requires rescue by a wildlife rehabilitator. If your cat or pooch has brought the baby chipmunk to you, it also needs help. Swoop the baby up in an old towel or t-shirt and contact a local wildlife rehabilitation center. If you're unsure of wildlife rehab in your area, contact your state's Department of Natural Resources or local humane society. However, if it's able to run and jump, it doesn't need help and you should let it be. Is It Orphaned or Abandoned? Unfortunately, many people believe that any baby animal they find outside of a nest is orphaned. This is not the case, and an attempt at rescuing these animals often strips them away from their mother. Upon finding the chipmunk, keep pets and other people away from it for an hour or so. Sometimes young babies get carried off from the nest by a predator or begin to crawl out on their own. Whatever the circumstance, give the mother time to find it and bring it back to the nest before intervening. Find a small box, such as a shoe box, to transport the little guy in to the wildlife rehabilitator, humane society or veterinarian. The box should have a lid to keep him safe, but not airtight or he'll suffocate. Place a hot-water bottle or chemical handwarmers under a cloth on one side of the box. Put on gloves before handling the small creature, then place him in the box and put the lid on top. Don't give him food or water during this short time. The Haven: So You Found a Baby Animal? Humane Society of the United States: Found an Orphaned or Injured Baby Animal?